When he first arrived at TSR, I saw his name listed as Steven Brown on the company phone list. Gradually at first, and then with the acceleration of a bullet train, he transformed into Stan! and has remained so ever since. We didn’t really cross paths very often until after the move from TSR in Lake Geneva, WI to Wizards of the Coast in Renton, WA. After the migration, I saw Stan! often at Chris Perkin’s 3rd Edition D&D playtest games and occasionally at other events, like the A Guide to Visitors spoken-word events, where we eventually enticed him into telling stories of his time in Japan. One of the founders of Super Genius Games and a frequent freelancer for other outfits, Stan! has remained ubiquitous in gaming circles long after leaving Wizards, as virtually all of us from TSR have done over the year. 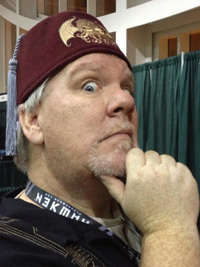 You can usually spot him across the convention floor by his frequent but often changing fez. 1. While we do a lot of work in common (writing and editing, for two), what interests me most about your creative output is your cartooning. How does it inspire your prose work and vice versa? Is it harder, easier, or just plain different to create visually? Almost everything I do starts out as a doodle or cartoon, or at least the ideas get expressed in my notebook that way. I doodle characters, little bits of dialog, even whole scenes. Often they’re without any real context at all. Sometimes it takes me a half-dozen or more doodles before I figure out who the characters are and what the story is about. Often—more often than not, really—it turns out that cartooning isn’t the right medium for the story or character. My cartooning style is very, um, cartoony, and isn’t the right expression for a lot of the ideas I have for stories, game adventures, and such. But it’s still the way the ideas first come to me. I used to do a—I don’t know what you’d call it—a webcomic or a digital sketchbook, I guess. Anyway, I had a daily updating site that was just images out of my notebooks. Often, I’d devote a whole week or more to related images that were done to work out a particular story idea. Once I had the idea out, though, I’d develop it in the medium it was best suited to. 2. 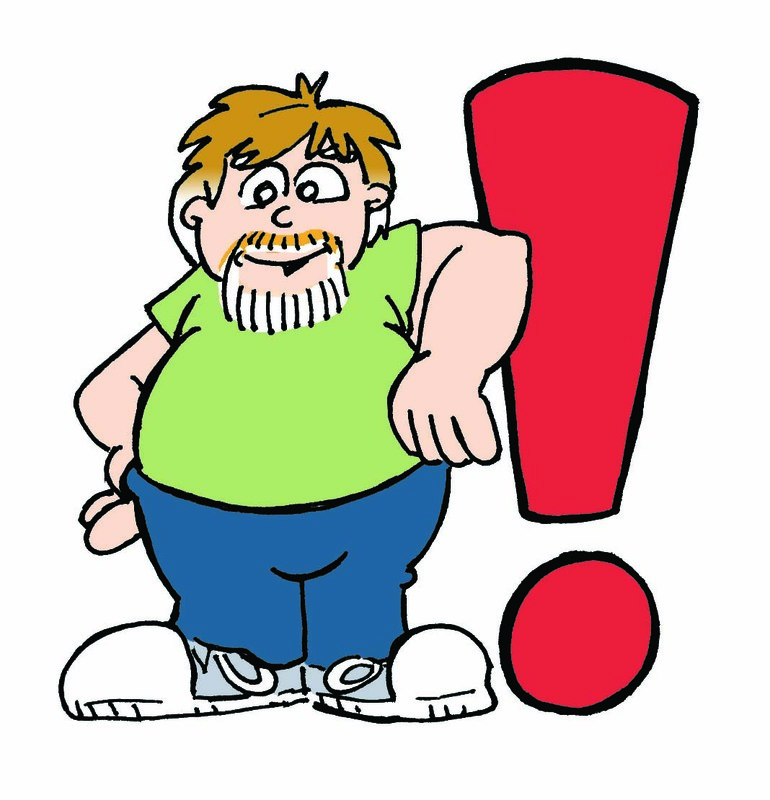 You’re among a large and vital community of game-related cartoonists and humorists. After almost 40 years of D&D and other RPGs, how has the humor well not run dry? Will the audience ever tire of monster and spell puns? How do you keep it fresh? I don’t like to think about that too much, for fear of realizing that I actually don’t have anything new to say. Really, though, I think that the humor continues to grow the same way that gaming culture does. What we do around the table (or in front of the screen, or on the mobile device) isn’t the same as it was 40 years ago, so the humor it engenders is different, too. Some gags still work, and it’s kind of depressing to me when I come up with a comic that would have been hilarious in a 1987 issue of Dragon, but now requires a paragraph of explication so that anyone under the age of 35 will understand. And yet, that’s funny, too. In the end, I make humor that comes out of my gaming experiences. So as long as I keep gaming, I’m sure to get new material. Actually, that’s one reason why I think it’s personally important to keep trying new games. If all I ever played was 2nd edition D&D (or even 3rd edition, for that matter), my gags would be stuck in the years that those games were published. That having been said, no, the audience will never get tired of monster and spell puns. In part because the audience keeps gaining new members, and in part because that kind of humor never goes out of style. Well, no more than it’s always out of style. We’re an odd lot. 3. Another cool thing you do which I envy is “localizing” manga after it’s been translated. Can you describe the process and its challenges? Sure. I do most of that work for Viz Entertainment, so my editor there sends me a copy of the manga in Japanese … which I can’t read. (I lived in Japan for five years back in the 90s, but I never got to be close to fluent.) He then sends me a file with a literal translation of the text. That’s pretty much word-for-word, with most of the idioms, slang, and regional dialect intact. That’s where my Japanese experience comes in handy, because quite often I can get a handle on what the intent of those phrases are, and what phrases in American English would carry similar weight. But the translators they work with are top notch, so they catch as much of that as they can—either attempting to Americanize the text or providing a wordy explanation of the intended meaning. The biggest part of my job is making sure that the dialog reads naturally in English. That people use appropriate contractions and idioms. That thoughts are conveyed in the order that makes the most sense. One of the biggest problems isn’t vocabulary or sentence structure, it’s paragraph structure and the way complex thoughts are strung together. Finally, I have to make sure that the now localized dialog will actually fit into the word balloons that are already on the page. That often involves more deconstructing of complex ideas and breaking them into smaller, comprehensible parcels that fit the available space. In fact, I’d say that most of my time and energy is spent in making sure that the text fits the page layout. Probably the most challenging part of localization, though, is dealing with the sound effects. In Japanese, they have a lot of onomatopoeia—specific sounds that carry a lot of specific information. They have particular sound effects for about six different types of rain, and at least that many types of wind. Where we have “gasp,” they have different sounds for a surprised gasp, a shocked gasp, a frightened gasp, a sad gasp, and many others. They even have a range of sound effects for different types of silence. We just don’t have that kind of range in our sound effects, so I have to find ways to convey that information, too. 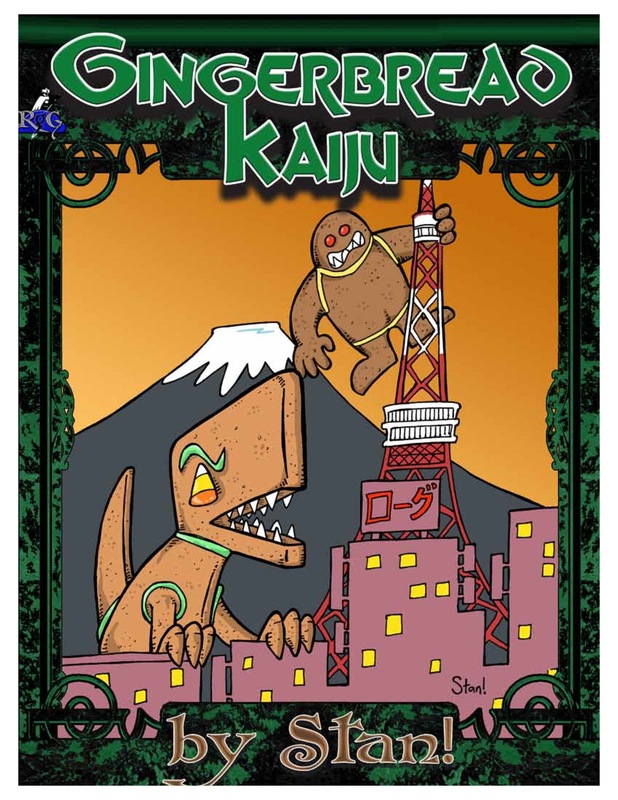 Gingerbread Kaiju, cover by Stan! 4. Of the various fantasy properties for which you’ve edited and designed over the years, which remain closest to your heart? Which, if any, do you play today? If we’re talking straight fantasy, like the D&D worlds, I don’t play in campaigns with any of them at this point. It’s one of the oddities of having so many friends who have worked on those worlds professionally, in our home games we like to explore new worlds. Plus, it’s pretty hard on a GM to have someone like Jeff Grubb in a Dragonlance or Forgotten Realms game. I still play a lot of Call of Cthulhu and other Lovecraftian games. I also remain stubbornly devoted to the Marvel Comics characters (though I have become one of those old fans who is certain that things were much better 20 or 30 years ago, which is fine if we’re playing an RPG, but tough on Wednesdays when I see what’s new on the shelves of the local comic book store). 5. Tell us a little about the formation of Super Genius Games, which recently split into separate entities. How will your new venture differ from the previous company? And what should we expect to see from you soon? Super Genius Games was a company that Hyrum Savage and I co-founded after I got laid off by Upper Deck back in 2007. We started out publishing mostly Call of Cthulhu supplements and OGL adventures. In 2009, though, we brought Owen K.C. Stephens on board to lead a project to start supporting the Pathfinder RPG … and, boy howdy, did he do that! Starting in November of 2009, we started releasing a PDF product every week, each straight to the point and tightly focused—like a feature article from an issue of Dragon. We figured we could keep that up for a while and make a splash with the PFRPG community. Most of the products were written by Owen, and all of them got his full stamp of approval before they went live. In the end, we kept up that weekly schedule for four years, ending just at the same time that Owen and I left the company. As to why we left the company … well, that’s a complicated matter. The short answer was that we looked at what the company was doing, and likely capable of doing in the near term, and what we each wanted the company to be doing, and we realized that they were no longer compatible. After looking at several different methods of remedying this, we finally decided that the best solution was for both Owen and me to leave Super Genius Games, and so we did. The thing is, what Owen and I wanted still was pretty compatible. So when he called me a few days later to say that he was setting up Rogue Genius Games, and ask if I would be interested in being a partner in the new venture, I said yes. The differences between SGG and RGG are going to be pretty subtle, really. But I guess they’re best emblemized by the first RGG-original product—Gingerbread Kaiju. We want the company to have a bit more of a wild, unpredictable side. Yes, RGG will publish “Genius Guides” in the style that SGG was known for, but we’re also going publish more stuff that lives on the fringe. Weird concepts, humorous material, stand-alone games, and other things that would have looked pretty out of place in the Super Genius portfolio. We’re taking the concept of “going rogue” and applying it to the projects we’re working on. You can keep tabs on Stan! at the Stannex, and be sure to add his 10′ x 10′ Cartoon to your web reader.